Ok, time for The Schlock: Crack Den to begin. It starts on Nine at 7pm. Tomorrow the teams scramble to finish their 48-hour challenge (that will be the usual “reno a bedroom so you get your pick of the apartments) and then Bathroom Week begins. Wednesday: More Schlock. Honestly, if you are not watching Australian Survivor already you can flick over right now. You know nothing much happens on The Block on a Wednesday. And if it does, you’ll catch it in the Sunday recap before the room reveals. Better to see a dead rat than a live specimen. Qld couple: Norm (builder) & Jess (radio announcer) doing it for the kids. Bogans. Will struggle with the judges’ snobbery. NSW: Sara (wanna be princess sorry flight attendent) Hayden (builder). How embarrassing for NSW. SA: Kerrie and Spence(This season’s oldies. No more information offered). VIC: Carla and Bianca. Professional netballers. Watch this friendship fizzle. WA: Hans & Courtney (another flight attendant and pilot) She is a screamer. Need duct tape already. 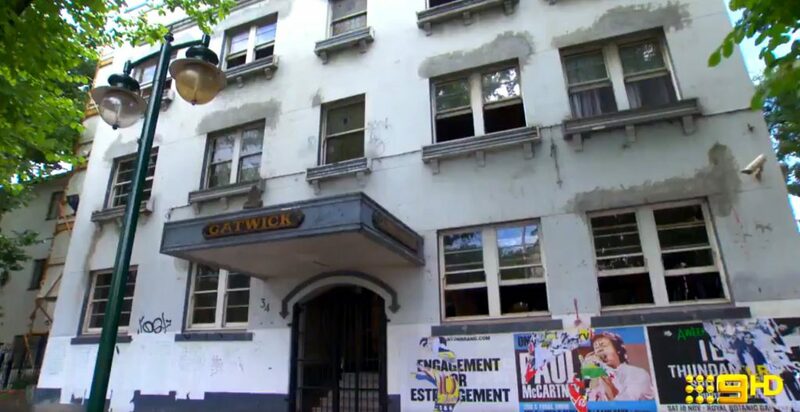 The Gatwick was approved for eight apartments- 6 x 3 bedroom, 2 x 2 bedroom. Don’t think the SA couple understand bogan. This is going to end in tears. Spencer you are on Ch9 not ABC. The radio lady has the worst voice ever for radio. How on earth did she get hired? Squealer is already annoying me to no ends. Thank god Volkswagen is a sponsor again, have fun with the Diesel dirt, Australia! I switched off fairly quickly. Maybe I just need a reality break. I will come back for the reveals … or maybe princess dramas. She seems to be a piece of work. Could be fun? I am hoping. Hmmm, the Sydney couple (Sara and Hayden) already have my back up. Juz, will scoot down to StK in the next few weeks for pics, if you like. I don’t know what Juz thinks but I am keen on this. I am sure it’s not a spoiler. Yes please! I’m sure nothing that hasn’t been in the local papers already. I am fast forwarding through it now. One woman just called the sheet curtains “transcendent”. Umm, transparent? Radio lady already annoying me.😏 Why must she keep blaming any action / reaction she has, on hormones?? Gggrrrr. Just to emphasize they can’t have a third child without intervention from the Block. With the exception of the SA couple (so far), they all annoy me so it will be a tough slog this season.